PRODUCT: Premium Poly Knit Glove with Double Dip / Extra Textured Blue Rubber on the Plam and Fingers. A long lasting glove. Trimmed with Elastic Extra Long Writs. Large Size. Price/Pair. DESCRIPTION: Do not confuse these with the cheaper single dip type gloves - these are very superior! 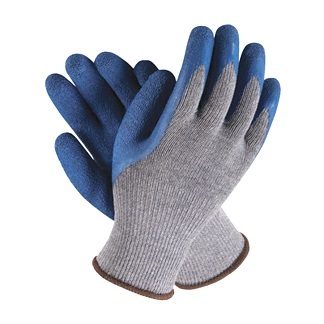 APPLICATIONS: Recommended for handling glass, metal, factory work, yardwork and other general work where a good feel, good grip, long wear and comfort are important.